Tony NO-mo: Is this the beginning of the end? In Sunday’s season opener, Cowboys quarterback Tony Romo looked more rustier than a Titanic artifact, more confused than Donald Sterling at an NAACP meeting, and lacked more rhythm than Napoleon Dynamite. In other words he appeared out of sync, lost, and still in preseason form. Coming off his second consecutive off season back surgery, one can only speculate if this is the beginning of the end for the underachieving QB. Tony Romo was quoted after the 28-17 loss to the San Francisco 49ers, saying that he made only “a couple of bad decisions”. Really, Tony? Just a couple for the whole game? He made more than a couple bad decisions in the 1st quarter alone. Not sure which two bad decisions he was talking about, but when I checked the stat line at the end of game he threw for three interceptions; which I believe equates to “three” bad decisions, at the least. And all three interceptions were produced on ill-advised throws. It is quite obvious that Tony needs to be more accountable for his poor play. At this point in his career, you can’t help but wonder what Romo has left in his tank. After showing lots of promise earlier in his career (and even considered an elite QB at one time), Romo has slowly diminished through recent years and is currently on a five year playoff drought. What I do not quite understand is (Cowboys Owner) Jerry Jones’ loyalty to Romo. We all know that Dallas went through years of inconsistency at QB post the Troy Aikman era; so maybe Jones was eager to appoint the next franchise QB of the organization. But was Romo the answer? Well as history has played out, he may not have been the correct answer. Practically every other game, Jones has to step to the media and defend Romo’s subpar performances or game-ending interceptions. It seems like Jones should be exhausted of constantly coming to Romo’s defense. Whatever the case may be, I applaud Jones for staying committed to his quarterback through the thick and thin. After all, not all quarterbacks in the NFL are fortunate enough to have the same kind of support. 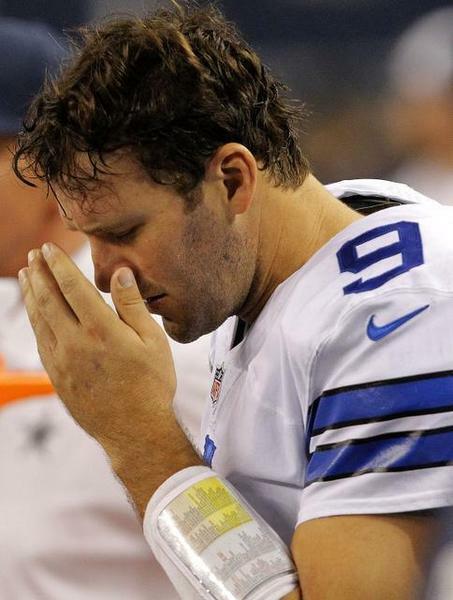 One thing is for sure: Tony Romo better get his act together, otherwise his days may be numbered in a Dallas uniform. Only time will tell.